Winter weather is nothing new to our region, or to Metro Transit. So when snow or ice arrives, we know how to respond. There are times, though, when conditions present unavoidable challenges. Such was the case on Monday morning, when freezing drizzle made traveling difficult across the region. The complications on the METRO Blue Line arose as ice began to build up on the rails and the overhead wires that power light rail vehicles. 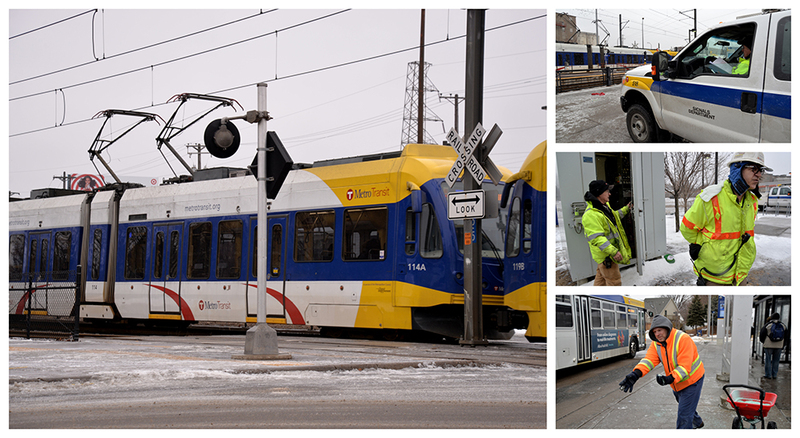 Many light rail vehicles have equipment that is designed to cut through ice on overhead wires. Frequent service also helps keep the rail and overhead wires clear. On Monday morning, though, the fast-forming ice was simply too much to keep up with. Ice becomes a problem when it interrupts the power supply. When power is interrupted, trains are programmed to automatically turn off to avoid damage. Several Blue Line trains stopped operating for this reason on Monday morning. Ice builds up on overhead wire in the section of track that isn’t being used. Disabled and slow-moving trains can also create problems with the system that runs the signals and gate arms. On Monday morning, crews were dispatched to several locations to manually control gate arms along Hiawatha Avenue. Extra train operators, technicians and other staff were also sent out to help restore and maintain service. Even so, the domino effect that began when trains stopped operating was difficult to overcome, Light Rail Director Mark Benedict said. “Once ice takes over and starts winning, we just have to fight the fight until we can get through it,” he said. “Even when we were having failures, we did everything we could to get trains to these stations because we know our customers were out there." There were also delays across the bus network on Monday morning, with nearly two-thirds of trips delayed by up to 15 minutes at one point. Despite the challenging conditions, all customers arrived safely at their destinations. By Monday afternoon, rail and bus service was largely back on schedule. Learn more about traveling safely during winter weather at metrotransit.org/snow. Above: A Blue Line train equipped with special ice-cutting pantographs (the equipment between the train and overhead wire) enters the 46th Street Station; Signals Foreperson Mike Miller and Signals Technician Terry Chacos monitor a crossing guard; Lead Public Facility Worker Andrew Gonzalez puts salt down at the 46th Street Station.